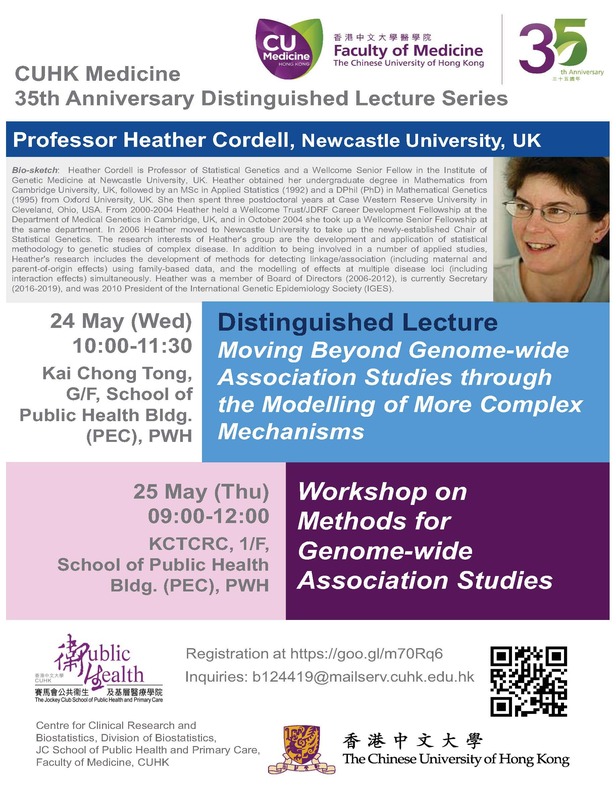 Professor Heather Cordell, Professor of Statistical Genetics and a Wellcome Senior Fellow in the Institute of Genetic Medicine at Newcastle University, UK will deliver a Distinguished Lecture on 24 May 2017 entitled: “Moving Beyond Genome-wide Association Studies through the Modelling of More Complex Mechanisms”, and a Workshop on “Methods for GWAS” on 25 May 2017. Bio-sketch: Heather Cordell is Professor of Statistical Genetics and a Wellcome Senior Fellow in the Institute of Genetic Medicine at Newcastle University, UK. Heather obtained her undergraduate degree in Mathematics from Cambridge University, UK, followed by an MSc in Applied Statistics (1992) and a DPhil (PhD) in Mathematical Genetics (1995) from Oxford University, UK. She then spent three postdoctoral years at Case Western Reserve University in Cleveland, Ohio, USA. From 2000-2004 Heather held a Wellcome Trust/JDRF Career Development Fellowship at the Department of Medical Genetics in Cambridge, UK, and in October 2004 she took up a Wellcome Senior Fellowship at the same department. In 2006 Heather moved to Newcastle University to take up the newly-established Chair of Statistical Genetics. The research interests of Heather’s group are the development and application of statistical methodology to genetic studies of complex disease. In addition to being involved in a number of applied studies, Heather’s research includes the development of methods for detecting linkage/association (including maternal and parent-of-origin effects) using family-based data, and the modelling of effects at multiple disease loci (including interaction effects) simultaneously. Heather was a member of Board of Directors (2006-2012), is currently Secretary (2016-2019), and was 2010 President of the International Genetic Epidemiology Society (IGES).